Irving Schoenberg in 1960 at his desk in the Pentagon. 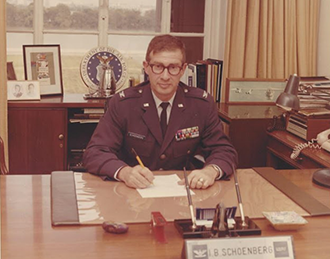 He served as executive assistant to undersecretary of the Air Force, after which he was awarded the Legion of Merit. Irving Schoenberg grew up in St. Joseph, Missouri, born into a family with a strong love for the Jewish people and Israel. He had an interest in going to the military throughout high school, even participating in a cadet program during his formative years. He graduated Central High School in 1943, in the middle of World War II, so he knew he was going straight to the army ("everyone old enough to walk was going to the military," he says). A year later, in 1944, he entered West Point for a four-year course. Getting nominated to West Point was a privilege requiring the nomination of a local congressman. Luckily, Irving had a connection to this official, Representative William Cole, through a high school faculty adviser. As Irv says, "one person can change your life without realizing it." Funnily though, his parents were staunch Democrats at the time (as were most Jews) but since Representative Cole was Republican, they swiftly switched their views and became supporters of his, going so far as his mother becoming chairman of the local Republican committee. Irving proudly received the next-in-line principal nomination, but in a case of "right place, right time," the first in line failed his exams, which led to Irving's appointment. A professional shot of Irving at the White House. Irving made his parents very proud going to West Point and the military. Irv's father was at first concerned, having served in WWI, stationed in France for two years and having had a less than ideal experience. 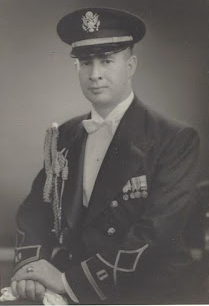 But ultimately, he provided a lot of "naches" (pride) to his parents. Irving ended up with a long and fulfilling 30-plus year military career. He began by serving in the Strategic Air Command, including service with the 307th Bombardment Wing in Okinawa during the Korean War. He then went on to teach a course called "The Psychology of Military Leadership" in the school of Military Science, a part of the University of Maryland. He even worked in the White House from 1954-1956 as a Social Aide to President Eisenhower! Immediately after retiring from the Air Force in 1973, and receiving his third Legion of Merit, Irv was employed for the next 18 years with Abrams Industries, Inc., in Atlanta, Georgia. During that time he rose to the position of Executive Vice President for Investor Relations. Following retirement from Abrams Industries in 1991, he originated and then conducted a seminar on "Investor Relations" for 5 years at the Goizueta School of Business, Emory University. Irving, second from left, is flanked by sons David and Jeffrey. One of his proudest accomplishments was toward the end of his military career, when he managed over 3,200 people as Director of Materiel Management at Robins Air Force Base in Georgia. He started "The Shadow Program", where lower lieutenants and captains would spend time with higher officers and learn about their day-to-day duties and leadership responsibilities. Irving says his No. 1 piece of advice is to be a true leader, in every facet of your life. Irving has been married to his wife Ann for almost 60 years, and together the two have three sons and four lovely granddaughters. 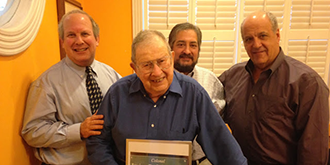 He grew up with a love for Israel, the Jewish people and the Jewish National Fund and instilled those passions into his own family, today being a gift annuity donor to JNF. 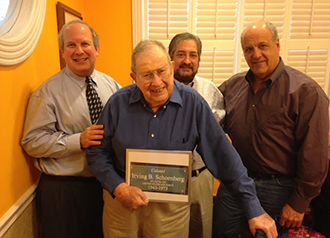 Irving turned 90 on November 5. Read more about Irving in this oral history interview for the Dwight D. Eisenhower Presidential Library, Museum and Boyhood Home conducted in 2010.